Monday, high 60, low 29, partly sunny and humid. Tuesday, high 35, low 25, cloudy and dry. Is it any wonder that Southerners stay confused all the time about the weather? When I went to New York in December of 2010, the entire time we were there the high was about 35 and the low was about 30. Five degrees of difference between day and night and you wore a heavy coat every time you walked out of the hotel. In Georgia it is not at all unusual to see a 40 degree temperature shift on any given day, from freezing in the morning to short-sleeve shirt weather by that afternoon. Severe thunderstorms are quite common with the number of climatic shifts that happen and tornadoes are not unheard of in any month of the year. There is an old saying about Southern weather: If you don’t like the weather, stick around 20 minutes and see what comes next. This is a lot more realistic than you think. Northerners complain bitterly about the cold winters and especially the snow they get and they have every right to because it inconveniences them often during the winter months. Down here, snow and ice are phenomenons that occurs once in a while, frequently skipping several winters in a row before making enough of a showing for us to give it a catchy name like “snowjam 2009” or “icejam 2011”. These are important titles because they are what we will use when we tell our grandchildren about the great snowstorm of some year that dumped nearly 2 inches of snow and which paralyzed the entire south for two days waiting on it to melt. It is a known fact that Southerners cannot drive on snow or ice and when we see someone that is able to, we automatically assume they must be a transplant from up north who probably moved down here to get away from that very thing. We hear the stories from up that way about people whose house was buried up to the gutters in snow and how they tunneled their way through the front yard to the mailbox and we marvel that such a thing is possible. Day 1: The weather service kicks it off by discussing a weather system that is happening in Texas and Oklahoma, where they are experiencing a massive snowstorm. 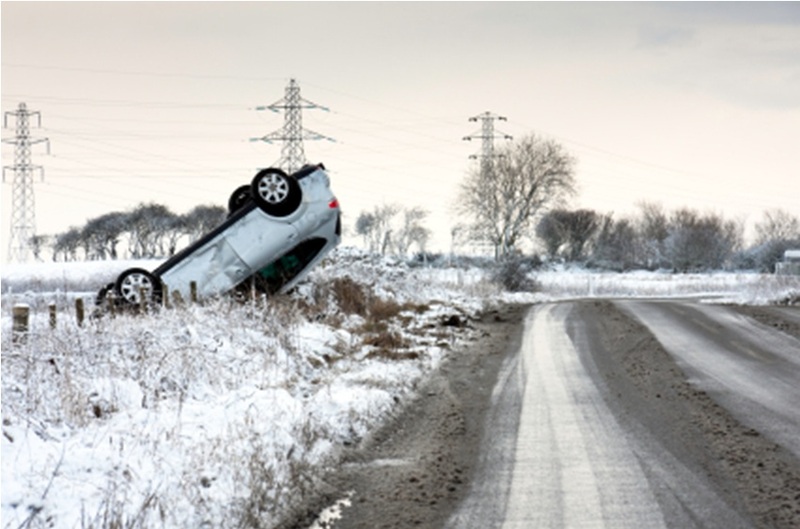 The stock footage is brought out of heavy snow falling, a tractor-trailer jackknifing on a bridge and a Buick LeSabre stuck in a ditch, spinning its wheels. 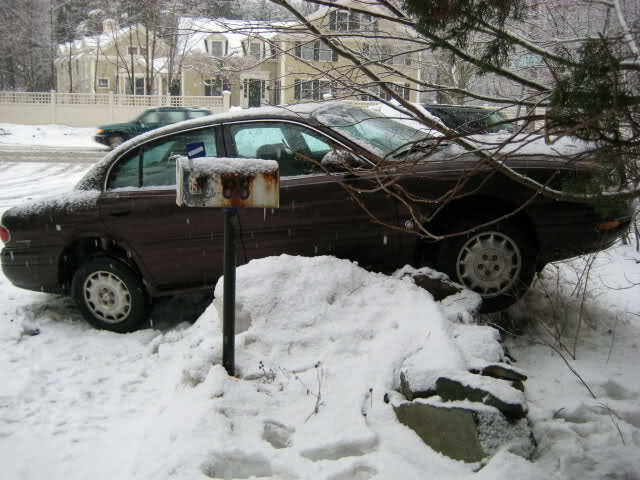 Never mind that the car in question looks suspiciously like the same Buick that got stuck in last year’s snow event and even the one before that. The weather service then attempts to plot a projected course for the storm system and deduces that it will hit somewhere between Brunswick Georgia and Brunswick Maine sometime within the next three days. The school system immediately goes to Snow Condition 4 (SNOWCON4) and the news of imminent snow is twittered and facebooked by everyone with an account as the speculation mounts. People consult their almanac, the internet and their dog Blue, who always seems to know something is going to happen. Day 2: As snowfall reaches Louisiana and into Mississippi, people go and buy chains to put on their tires, never mind that they have no idea how to install them. The batteries are cleaned from the store shelves, everyone fills up their cars with gas and then they head to the grocery store where, apparently suffering from an overwhelming desire to make French Toast, they divest the store of all the eggs, milk and bread. As the day progresses, people begin to grow more concerned about school and they begin to call the E-911 emergency number to find out if the schools have made a decision about closing, two days before the possibility of snow arrival. The evening news tells that the snow will reach Alabama in early morning but that it seems to be weakening as it gets closer. Parents breathe a sigh of relief while the collective prayers of many hundreds of thousands of schoolchildren are raised to help encourage the snow and beef up the amount that might fall. Day 3: Children jump out of bed and head to the window, hoping that some miracle happened and that the snow leapfrogged over the state of Alabama to dump 12 feet on Georgia. No such luck and they reluctantly head off to school. During the day, the three Atlanta networks begin ramping up the weather coverage and begin speculating about where snow might fall. No two estimates are the same and the predictions are all over the chart. Facebook is alive with further speculation and reports of cash registers running short of receipt paper spur yet another run on the grocery store to buy more eggs, milk and bread. The kids get home from school and are treated to images of Alabama children playing in their yards, building snowmen and crashing into trees with their makeshift sleds. The prayers escalate in intensity as they begin making promises of good behavior and helping the parents around the house if it will just SNOW hard enough to keep them from school. The school systems, meanwhile, are totally confused by an influx of conflicting weather reports coupled by phone calls from concerned parents. They go directly to SNOWCON1 and make the big decision: No School Tomorrow! SnowJam Two Thousand Something: Children awake and run to the window where a light dusting of snow has accumulated on the ground. They gulp down some French Toast (there is plenty to go around), pull on their coats and head outside to run and play in the quarter-inch of snow. Scraping all the snow from the trunk of the car and the hood yields a total of two snowballs, resulting in a vigorous, if very short-lived snowball fight. Parents stay indoors and watch the television as one film clip after another is shown in testimony to the fact that we just can’t drive on this stuff. Finally the kids get tired of trying to scrape up enough snow to make a miniature snowman and they come in to get warm and talk about what might have been if it had JUST SHIFTED a little further to the south. The event is over and the temperature tomorrow is expected to get up to 70. Life goes back to normal. Ok, this isn’t how it ALWAYS is. Sometimes we actually get some real snow and then everybody has fun but only once in my life has the snow ever lived up to the pre-event hype that surrounds it. That was the Blizzard of ’93, aptly named because it was in fact a blizzard, the first one I think the state of Georgia had ever experienced. It wasn’t a fun snowstorm either. There is just something about 50 mph winds and thunder with lightning against a backdrop of driving snow that just takes some of the magic away from it. We lost power for days and when the French toast ran out, we had to make do with what we could find that didn’t have to be cooked. The house got down to a very un-cozy 45 degrees and I suddenly found myself wanting to go back to work where there at least was a generator and a Mr. Coffee. I don’t know that I will ever see an event like that one again here in the Deep South, nor am I sure that I would want to. We just can’t handle it. I would just settle for some normal winter, maybe a pretty snow and some consistency for more than two days. Maybe February can get its act together before Spring blows in. If not, I’ll just keep adjusting the thermostat from heat to air conditioning and ride out the rest of winter in a state of indecisiveness and barometric confusion. I lived in northern Indiana during the Blizzard of ’78, which coincidentally was at its peak on this day that year. Our house was almost buried in snow. Snow covered the windows and kept the doors from opening. We opened the garage door with considerable difficulty and shoveled snow into the garage to get out. The city was shut down for two weeks. When the snow plows finally cleared enough of the streets, they reopened the schools on limited schedule, which lasted several weeks. I remember riding around town in Dad’s car with the snow piled so high that you couldn’t see except straight ahead. I live in central Indiana now. This feels like the tropics compared to what I grew up with. What you describe in Georgia sounds almost like heaven. I can’t imagine having to deal with snow like that but we do feel lucky when we see some because its usually just enough to enjoy and not enough to be a nuisance. Very witty piece and so true. Your phase of “barometric confusion” sums it up perfectly!